History: Pandalus platyceros is the scientific name of this particular prawn. It goes by three names, California spot prawn, Alaskan prawn, or simply, spot prawn. Despite the name and size, they are shrimp and not prawns; prawns are larger than shrimp. Their habitat is in the Pacific Ocean, stretching from San Diego all the way to Unalaska Island, Alaska. Unalaska is midway on the “trunk” of the tip that juts out on the lower-west side of Alaska. 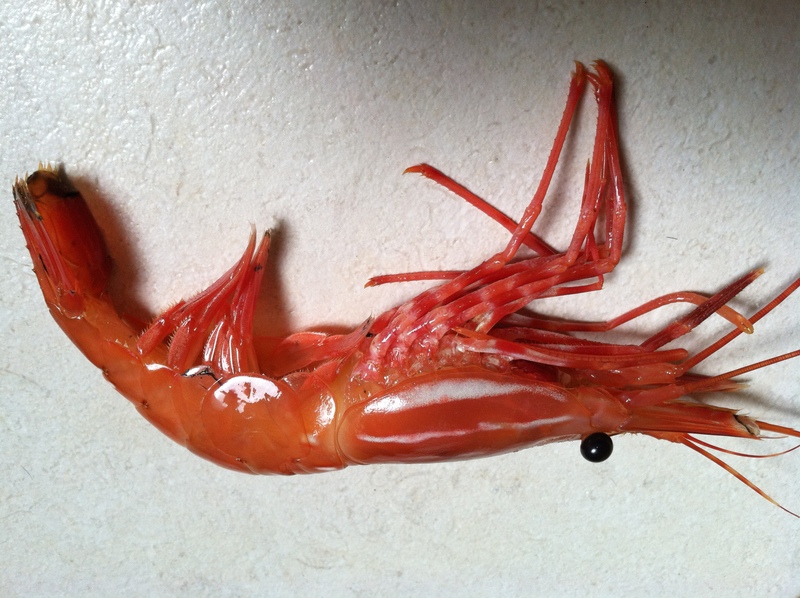 Spot prawns reside 600-1,000 feet deep in the sea. The largest commercial fishery is in British Columbia and many are caught near the Santa Barbara Channel Islands. in the One might wonder why the price of the spot prawn is so expensive even when bought locally. The answer lies within the way it is caught. The spot prawn is caught and hand picked from pots (3 feet in length); which makes this practice extremely sustainable. Prawns range in sizes and females can grow longer than 9 inches (23 cm). 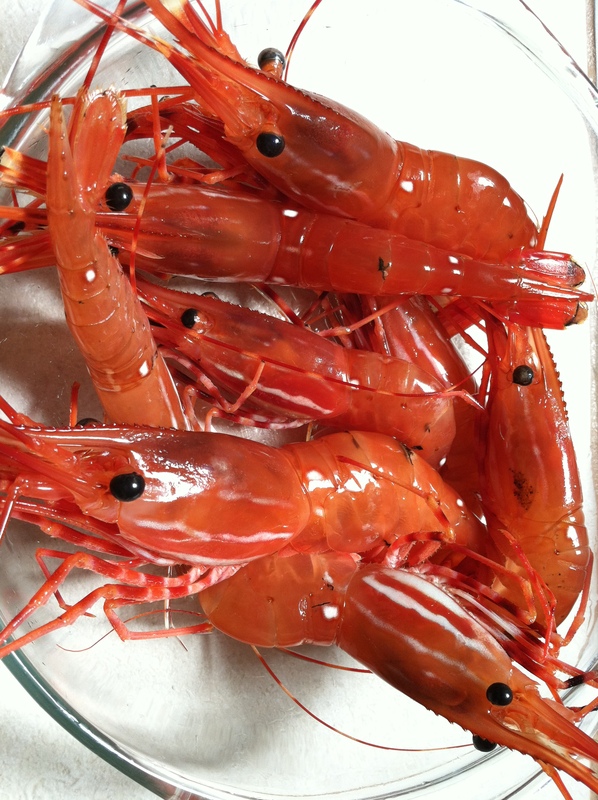 One can buy spot prawns live at local Asian grocery stores, ranging from $13-$19 per pound. They can be found in aquarium like tanks that contain really cold (40 degrees Fahrenheit) and oxygenated water to mimic Alaskan prawn habitats. Although similar in appearance, do not confuse the Alaskan prawn for the sidestripe shrimp (Pandalopsis dispar) or the coonstripe shrimp (Pandalus hypsinotis). 1. Pick up the prawn and squeeze lightly. It should feel firm. If it is not firm, it is not fresh even if still alive; the spot prawn you picked up has been residing in the tank too long. 2. Make sure your prawn has as little black spots as possible. Preparation: The key is to cook them as soon as possible after purchasing the spot prawn. Otherwise the meat will get mushy even if you boil it correctly. That’s because an enzyme from the head is released and migrates towards the tail making the meat mushy. Therefore, if you don’t see yourself eating it immediately, I would remove the head once you arrive home, if you plan to eat it raw. If not, do not separate the head from the body. Place them on ice/bucket and store in the refrigerator until you are ready to boil. Peeling: The prawn shell consists of several sections. 1. First, detach the head from the body. Head was kept together, above to show the insides of the head. If you’re lucky you’ll have a hard red brain. This is solid the other juices could range from brown/red/olive green but are still excellent. 2. The prawn body consists of separate segments. Peel off segment by segment starting from the bottom (works like a circumference of a circle). The tail is the delicate part and if you shake it a little while holding onto the body, you can keep the tail meat intact as shown above. Devouring: If cooked correctly, the prawn should have a rubber combined with a solid crunch when biting into the meat. Not cookie crunch but the meat will first provide resistance then break clean. It is very sweet which is what the spot prawn is known for. Random Facts: Spot prawns change sexes meaning they’re hermaphrodites. They all are born as males and some say they change to females as early as year 3 to as late as year 4. When they start off as males, they last one spawning cycle and complete two more once they become females. Spawning happens from September to November and eggs start showing from October to April; you will literally see thousands of orange eggs underneath the prawn in their flippers (technical term is setae). 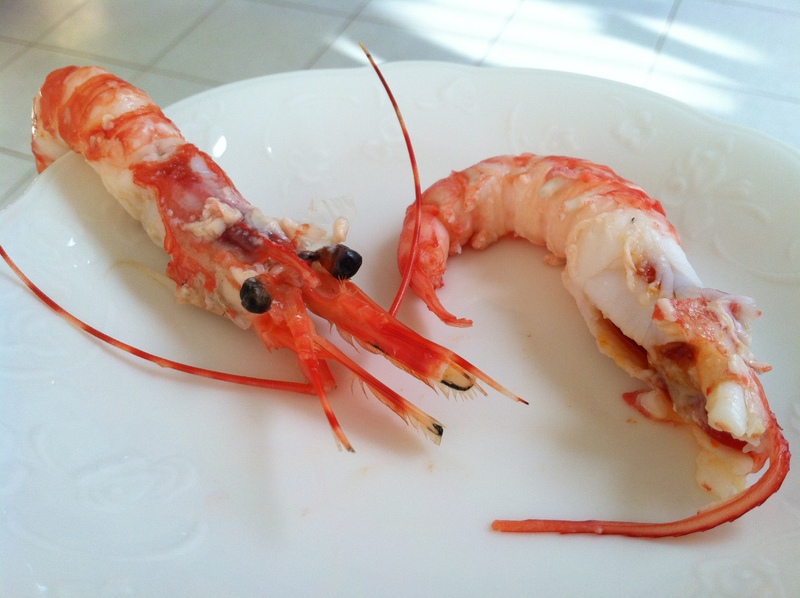 In Japan, where these are imported, the Californian Spot prawn can go as high as $20 each! Have you ever had Californian Spot prawn before? How do you go about eating it?